Carthage (Phoenician: 𐤒𐤓𐤕 𐤄𐤃𐤔𐤕, Qart Khadasht; Greek: Καρχηδών, Karkhēdōn; Latin: Carthago; Arabic: قرطاج, Qarṭāj; "Name means::New city") can refer to an ancient city on a peninsula in the Bay of Tunis, in modern Tunisia, or the the ancient civilization within the city's sphere of influence in northern Africa, in much the same way "Rome" can refer to the city or the ancient civilization. 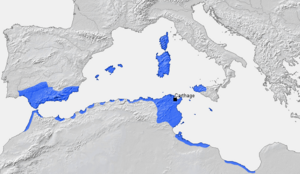 Map of the Carthaginian Empire. It was founded in the 9th Century BC by Phoenician colonists. It became a great commercial city and imperial power, controlling an empire in North Africa, southern Spain and the western Mediterranean islands. The rise of Rome in the 3rd century resulted in the Punic Wars and, in spite of the victories of Hannibal, ended with the destruction of Carthage in the Third Punic War (149–146 BC). It was, eventually, resettled as a Roman colony. 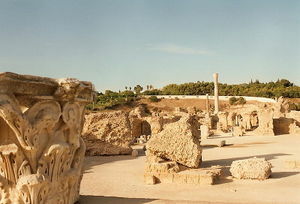 In the 5th Century AD, it was captured by the Vandals and made their capital city. In 533–34 it was captured by Belisarius and was part of the Byzantine empire until its destruction by the Arabs in 697 AD. This page was last modified on 29 June 2013, at 08:25.